City Series is a new public lecture series in Leicester that delivers free events relating to a wide range of urban topics, such as architecture, history and geography. This is a collaboration between Leicester City Council, De Montfort University, University of Leicester, and Loughborough University, with speakers from those institutions and from the wider community. The latest talk will be delivered by Tim Skelton, author of ‘Lutyens and the Great War’. Tim has written on a wide range of subjects, including travel and history, but has researched the work of Lutyens extensively and is a member of the Lutyens Trust. The work of the eminent architect Sir Edwin Lutyens is central to the way in which we now remember those who have given their lives in the service of their country. His Cenotaph forms the centrepiece of Remembrance Sunday and the Memorial to the Missing of the Somme at Thiepval is the largest British war memorial in the world. 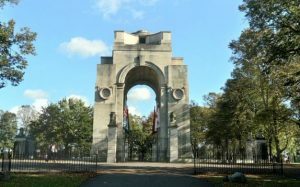 Less well known is the work that he did for the Commonwealth War Graves Commission in the design of cemeteries on the Western Front and the 50 memorials that he designed at home and abroad including Leicester, which was the largest of all. As well as inspiring architecture, the commissioning of the memorials tells interesting stories about British communities as they sought the best way to mark the loss that they had suffered.